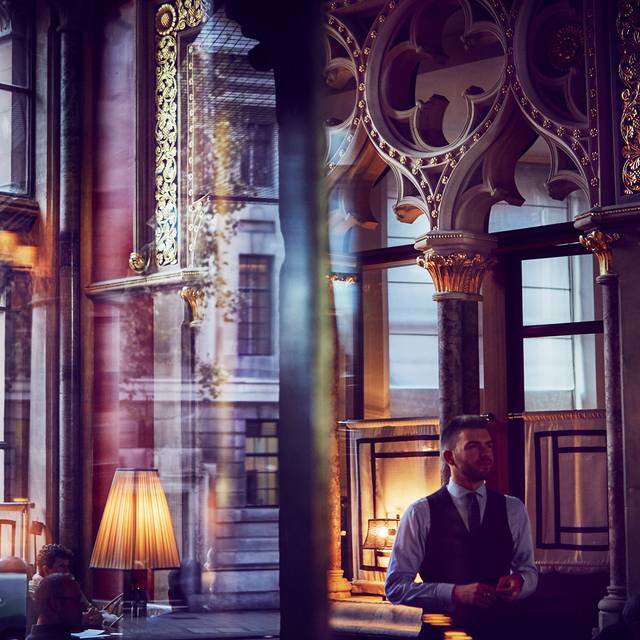 The Gilbert Scott is Marcus Wareing’s elegant, grand dining restaurant located in the 19th-century surrounds of St Pancras Renaissance Hotel in King Cross. 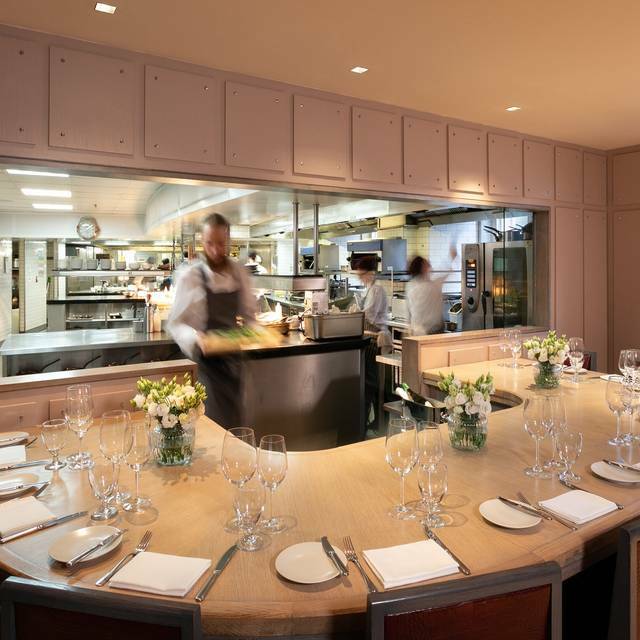 Showcasing the finest British seasonal produce guests can also book a lively Chef’s Table in the restaurant’s engine room and an elegant Private Dining Room for groups of up to 18. 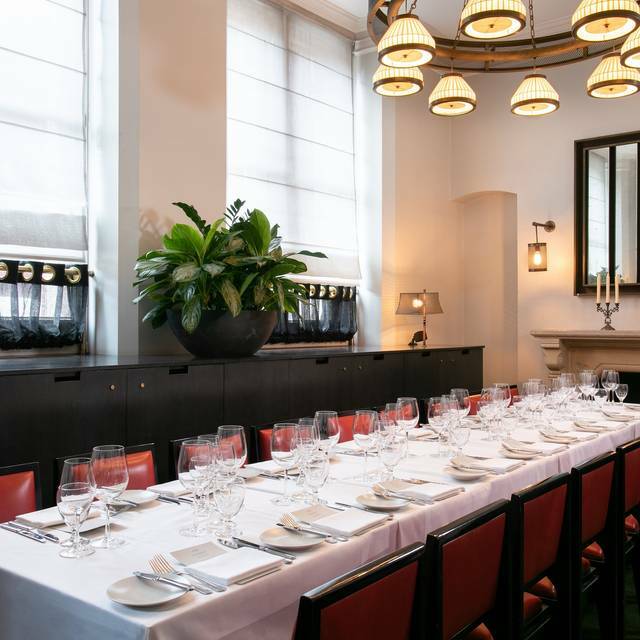 Guests can also enjoy an evolving and seasonal cocktail list, as well as afternoon tea and Victorian surrounds of the adjoining George's Bar, which has quickly cemented its reputation as one of the best bars in London. 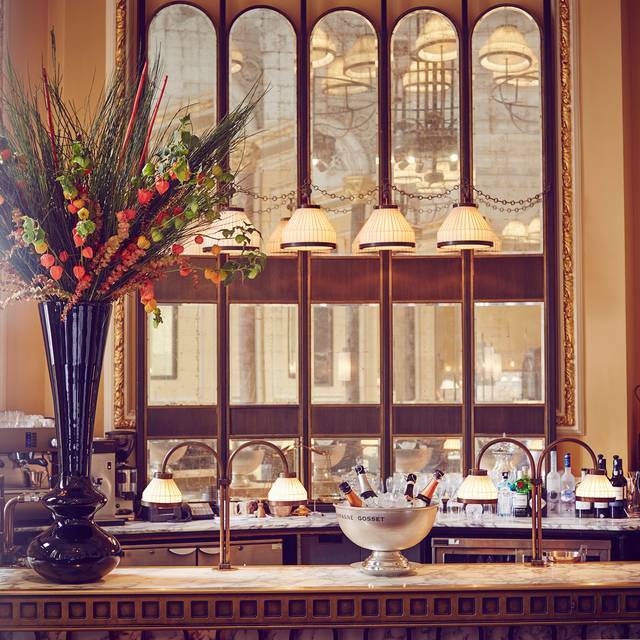 The Gilbert Scott is an elegant restaurant and bar, showcasing the finest British seasonal produce in the 19th-century surrounds of St Pancras Renaissance Hotel, and provides guests with the ultimate grand dining experience. Enjoy 3 courses and a cocktail for £30. 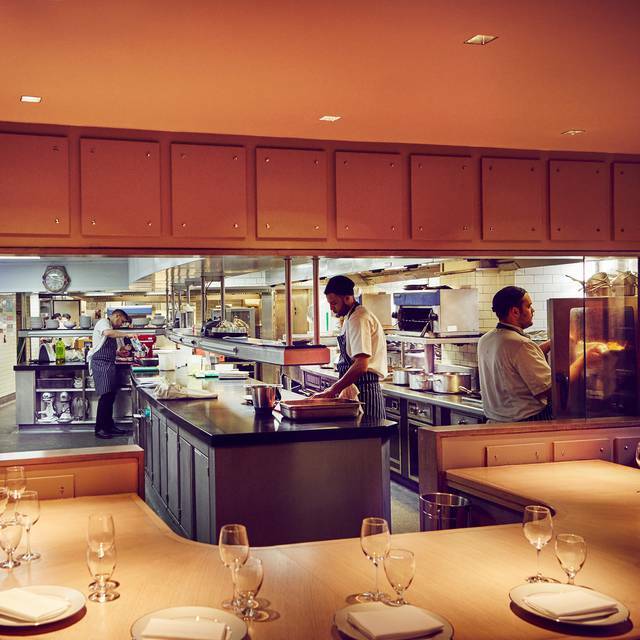 We booked, what appeared on the face of it, to be great value for London at £30 for 3 courses and a cocktail. However, whilst I knew there would be a service charge I didn’t expect our bill for two to be £125. The mains didn’t arrive with anything so you need to order at least two sides at an average of £5 a side and a decent wine is upwards of £50 a bottle. I would probably go again, but would allow a bigger budget! Good food & service. However, an extra drink was put on the bill by mistake. This was corrected when queried. Excellent relaxed lunch in a quality ven. Very polished team and excellent tasting food. Had a lovely time here - very good value evening offer and the service was great. Would recommend. I love this place, I intend to make it my new local cafe and the place for a family Sunday roast. Awesome wine pairing. Cocktails great too. Pretty Much as expected. Good food coooked expertly, very plush restaurant and fine wines. Every dish tasted beautiful and I had no complaints from my guests. As far as value for money goes I supose it depends on your perspective. The portion sizes were small but it is a top tier restaurant and expected to pay big money for small dishes. I would happily go back. As always it was a pleasure to dine at this marvellous restaurant. I really cannot praise it highly enough. 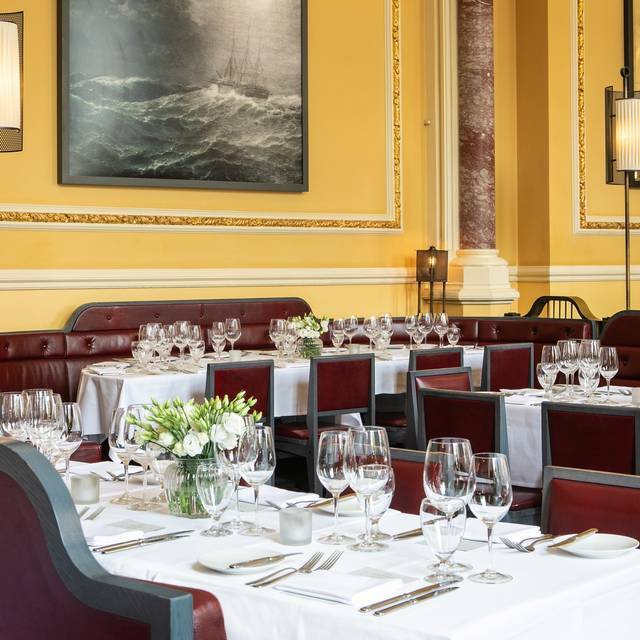 Of special note, the beautifully restored dining room, and the relaxed and friendly (but always professional and efficient) service. The one black mark: the very noisy and poorly laid-out 'George's Bar' - surely in need of a rethink. 4th visit and it's always as good, great food and service, great atmosphere and highly recommended. 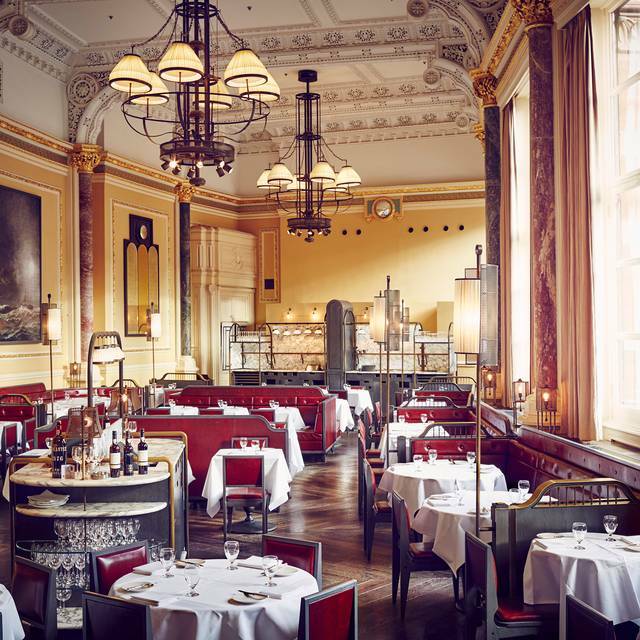 The dining room in this outstanding Victorian building is beautiful. The food is also excellent; I can recommend the asparagus starter and the pork and rhubarb main. The only real drawback is the price of the wine. The cheapest bottle that I could find on the list was £39. A mixed experience. Lovely room, uncomfortable seating. Some excellent food, some not, and an ice cream that tasted of Mr Whippy. 3 courses & cocktail for £30 is excellent value, everything else is designed to take as much money as possible. This last point was the real problem, plus erratic service and a questionable attitude. I (as the organiser of the evening) asked if we could have bubbly instead of a cocktail. The sommelier was charming and offered kir royale or cremante. Perfect. When we were ready for them and I ordered these, I was told by two stuffy staff this was not possible, who told you that, we don't do that, etc. Not perfect. The sommelier returned to save the day. Worse, I asked for tap water for the table. Someone else later was asked which water, they said sparkling. The staff decided without asking to keep every glass full of sparkling water. I hadn't realised this until the bill came for 10 bottles of sparkling at £40. The whole scheme was designed to charge us for as much water as possible. They didn't keep any tap water coming at all - presumably because it is free. They didn't ask anyone if they wanted a 2nd bottle of sparkling, nor a 3rd...etc. And don't most restaurants now just make one water charge per sitting anyway? I had to challenge this twice to get the charge off the bill. They were reluctant and rude. This also happened with the bread - I declined bread, so they decided to ask someone else down the other end of the table (like the water) later in order to get it on the table and the bill. Obviously it was too late for me to say anything when it was served. Of course the 3 for £30 courses were designed to be too small to not need pricey sides as well. If you don't want people to have 3 courses for £30, then don't offer it. And certainly don't use it as a cover for trying to rip people off. A very pleasant set lunch at the restaurant with nicely prepared food (they shouldn’t have served the roast potatoes that were burnt though). Lovely setting and ambience. We celebrated my Dad's 90th birthday at Gilbert Scott. The restaurant is a very beautiful room in such a historic building. The food was delicious but above all the waitresses and waiters were outstanding and we came away feeling incredibly fed and well looked after. Thank you! We have been before on a number of occasions. We decided to go on the2nd March as we have birthdays on the 1st and 3rd. Service was good food as always excellent. We were a little concerned as the tables around the outside are pretty close together so had we had someone on the middle table it would have been within inches of our and the third table in the annex which would not have been good and would have ruined the evening as it is far to close. Fortunately no one was placed there so it was pretty good. 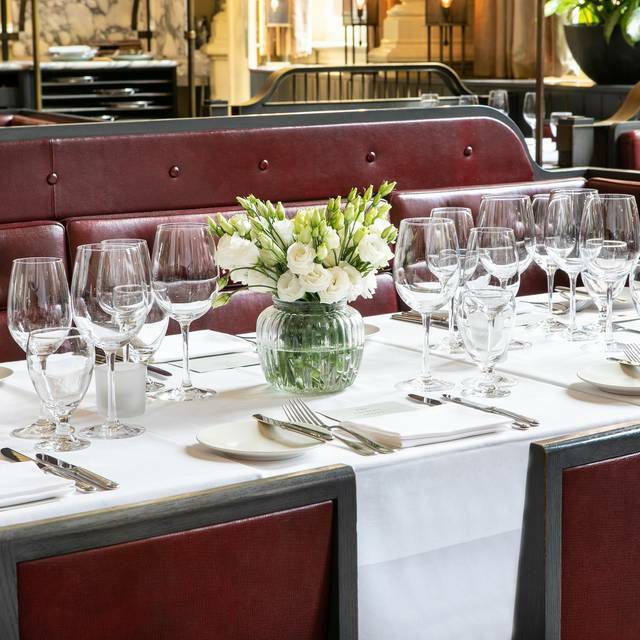 This was our first visit to The GIlbert Scott and we really enjoyed the experience. Dining room was a lovely room with good ambience, attentive but discreet staff. Small portions so not fantastic value for money but food was delicious. Had a drink in the bar out front before hand, lovely! I’ve been to the Gilbert Scott a number of times before but this visit was disappointing. Poor service, incorrect meal brought to the table, little apology, starters were average and cocktails were insipid. Fantastic restaurant, right beside the world’s greatest station. Good value set menu in traditional setting with great service. Nice place, staff almost too attentive. Struggling to get 5 minutes of conversation in between interruptions. Feedback to restaurant would be to tell staff to chill out. Obviously this is ether than the alternative. I had deliciously rich veal sweetbreads to start, followed by a veal loin which was lovely. Some cheeky chips with vinegar mayo were out of this world. A carafe of Mersault complemented all of this wonderfully, to make for a perfect pre-Eurostar lunch! Another good lunch with family..a nice little table in a quiet corner so that we could have a good catch-up chat the Cornish lamb was delicious & very generous in portion size. All staff were kind & courteous as usual.. overall a very good experience. Mixed feelings on this one. Wonderful room and good food but service was odd. I had to make a real effort to get the cocktails that were part of the offer and that was embarrassing in front of my guests. There was quite a lot of pressure to order wine and the wine list was horribly expensive. Also the 3 course meal did not include veg or potatoes so the final bill was a lot more than I had planned on. It was for husband’s birthday lunch. He had “Happy Birthday” plate of little desserts, which was a nice touch. Enjoyed the meal. Service was great! Never fail us every time we dined in. We had the set menu and were disappointed with the food quality, especially the soup. Service was average at best with junior staff who weren't particularly attentive. Disappointed. Satisfactory but not amazing food. We were disappointed. The food was unexceptional and the menu choice was limited. We were hoping for so much more. I paid for 3 people and there was only 2 of us? I have not got time to write a book for you. Food was gorgeous as always. Service was a bit poor and I had requested a celebration plate as it was my friends 50th birthday and it did not arrive. I have used the restaurant many times with 5 star reviews but this occasion was very disappointing. Large white triangular shaped fatty lumps about the size of broad beans in my crispy pigs head starter. Maybe that was a wrong choice for me as texture overall was not to my taste. However the steak was black on one side where I had to slice it off and leave on the plate it was so burnt and was not edible. The middle of the steak was lovely and perfectly ‘medium’ pink. The triple cooked chips were also inedible as greasy and empty inside - the waitress agreed that she’d ‘seen someone else’s and they shouldn’t look like that’ there was a reduction on the bill to compensate but overall extremely disappointed that I’d taken a colleague here as my favourite London restaurant. 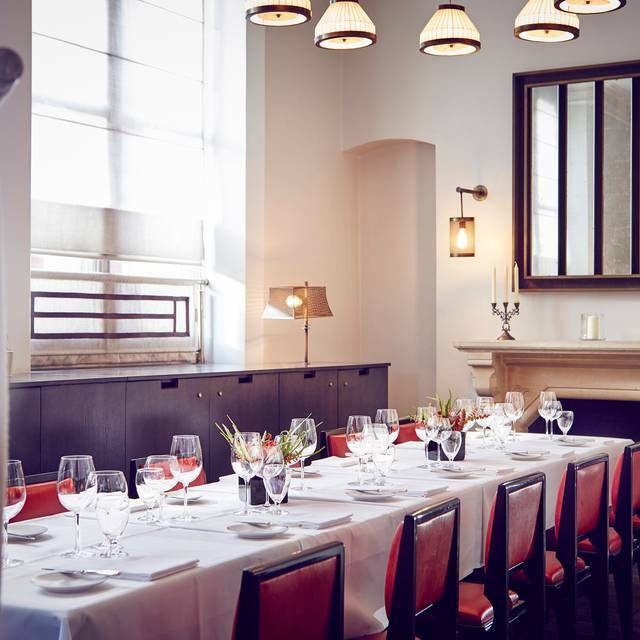 The Gilbert Scott is an amazing dining room with a great menu and good service to boot. Love this place. Excellent atmosphere, attentive but not intrusive service an great food. Thank you. Stunningly beautiful dining room with excellent service, but disappointing food. Fussily served with plainly cooked steak and salmon, and miniscule vegetable accompaniments. Side orders were expensive, pushing up the overall price. I can't recommend it to anyone as the food was so unmemorable. Sorry.